With the unveiling of latest range of advanced multi-mode chipsets by prominent makers, the global multi-mode chipset market is set to see a major boost in the coming years. Market research company, Transparency Market Research (TMR) finds that several companies are aiming to bring substantial improvements in their current offerings, in order to gain a competitive edge over their peers. To this end, they are also entering into partnerships for launching advanced multi-mode chipset solutions with lower footprints aimed toward meeting the needs of high-speed networks in applications. 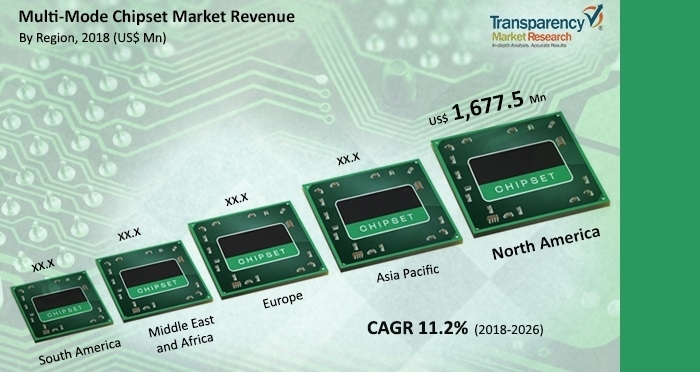 According to a recent report by TMR, the global multi-mode chipset market stood at approximately USD 4,509.7 million in 2017 and is projected to register a promising CAGR of more than 11.0% from 2018 to 2026. Of the various application segments, smartphone is expected to lead the pack in the global multi-mode chipset market throughout the assessment period. The segment is projected to rise at the most attractive CAGR of 11.6% during 2018-2026. The vast uptake of multi-mode chipset is fueled by the rising demand for smartphones that can support high-speed data transmission and the rapid emergence of 5G. On the geographical front, North America contributed the major revenue share in the global multi-mode chipset market in 2017 and is anticipated to rise at rapid CAGR of 11.9% over the forecast period. The growth is driven by sizeable industry investments in advanced cellular connectivity technologies, notably LTE and 5G. The staggering drive for multi-mode chipsets stems from the need for bolstering cellular connectively and data transmission speeds in a range of applications, notably internet of things (IoT). Enormous growth avenues in the multi-mode chipset market are likely to come from rapid advances in LTE IoT technologies for supporting rapid deployment of 5G. Rapid advances made in wireless communication networks in various countries with regard to their capacity and speed have provided robust growth momentum to the global multi-mode chipset market. The deployment of LTE networks by telecom operators in several countries world over is also a significant trend bolstering the uptake of multi-mode chipset market. The growing popularity of commercial devices that integrate 5G NR modems for supporting ultra-high broadband speeds and wider bandwidths is a potentially favorable trend expanding the market prospects. Moreover, the rising deployment of networks with integrated Gigabit LTE is boosting the demand for multi-mode chipset. Recent efforts by industry players in numerous developing and developed countries to increasingly deploy 5G technologies have imparted a big fillip to the expansion of the market. However, there are considerable challenges to the widespread 5G deployment across the globe, which is expected to hamper the steady expansion of the multi-mode chipset market. Nevertheless, in the coming years, several large-scale trials of 5G New Radio interfaces for next-generation of mobile communications are likely to take place. The rapid evolution of 5G models will accelerate deployments in the coming years, thus fueling the rapid strides the multi-mode chipset is expected to take. Furthermore, the rising popularity of premium-tier mobile cellular devices is creating new, exciting prospects for manufacturers of multi-mode chipset. The study presented is based on a report by Transparency Market Research (TMR) titled "Multi-Mode Chipset Market (Application - Smartphones, Tablets, and Wearable Devices) - Global Industry Analysis, Size, Share, Growth, Trends, and Forecast 2018-2026".